Sauce Robert is one of the ancient sauces. Mentioned in literature and dating from at least the 15th century, it remained popular right through to the 19th century (although you can still buy bottled Sauce Robert, it is nothing like the original). The sauce is used brilliantly in the 17th century by the legendary cook La Varenne in a dish made with pork (you can read more about the history HERE.) This is no surprise since the sweet and sour oniony mustard sauce is a perfect accompaniment to pork. 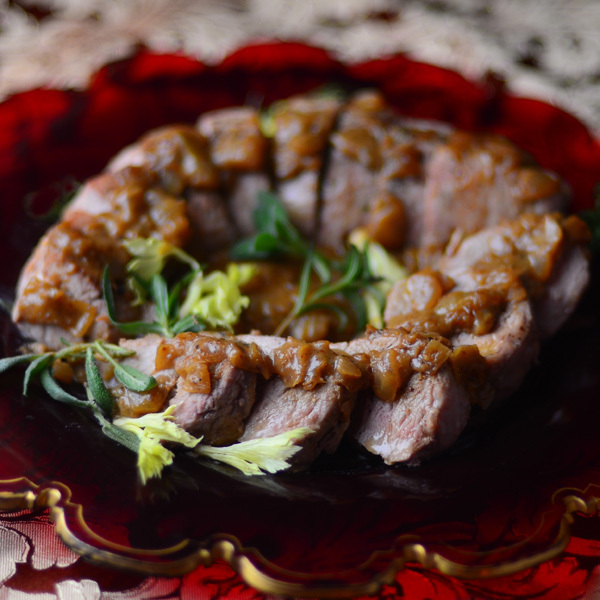 Although the original was made with the whole loin, I decided that I would use D’Artagnan’s tenderloin for this recipe since I love the texture. Also, D’Artagnan’s Berkshire Pork has such a full flavor, unlike any supermarket tenderloin you are used to. It’s great pork, and the careful way it was raised can be tasted. Since it cooks quickly, a meal fit for a king can be ready in no time. Cooking the onions slowly is the longest step. Heat the butter in a skillet and add the onions and one of the sage bunches. Cook at low heat for about ½ an hour till soft and sweet, stirring regularly. Put the lard or butter in the heated pan, salt and pepper the tenderloins, put in the skillet and brown the meat over high heat for a minute or two on each side. Put them in the oven for 10 -15 minutes or until the internal temperature is 145º. Remove from the oven and tent while you finish the sauce. Remove the sage, add the verjuice and vinegar and begin reducing over medium-low heat. Add the demi-glace and stir till you have a thick sauce. Pour any juices from the pan (after removing excess fat) and pour any accumulated juices from the plate into the sauce. Add the salt and pepper and cloves. Taste for seasoning and then add the mustard. Serve with the sliced tenderloin garnished with the rest of the sage. *originally long peppers and grains of paradise would be used…they are great so use them if you can get them. Previous Post Ham, Glorious Ham!